Porsche maintains its success streak in the Tudor United SportsCar Championship: The 911 RSR has scored its second GTLM-class win of the season in Bowmanville. On the challenging 3.957-kilometre circuit not far from Toronto, recent Le Mans winner Nick Tandy (Great Britain) and Patrick Pilet (France) secured a convincing lights-to-flag win after the two hour forty minute race with the number 911 vehicle. With a total of six GT wins at the former Mosport International Raceway, one of the most historic race tracks on the North American continent, Porsche as the defending champion has moved up the manufacturers’ standings to now rank second. After the wild weather conditions recently in Watkins Glen, the sixth round of the popular US race series was contested in summer temperatures and under slightly cloudy skies. 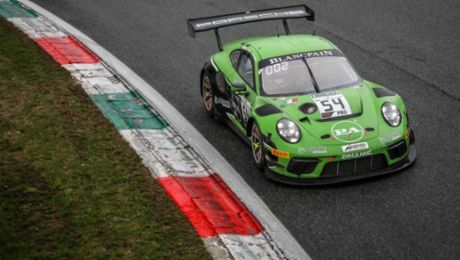 At the wheel of the 470 hp 911 RSR, which is based on the seventh generation of the iconic 911 sports car featuring lightweight design and sophisticated aerodynamics, Nick Tandy headed into the race from pole position for the first time this season. In the very first lap, he pulled clear of his pursuers, but lost his advantage after a good half hour with the first caution phase. After the first pit stop, his teammate Patrick Pilet took up the race again at the head of the pack and fended off strong opposition from BMW, Chevrolet and Ferrari, before handing the 911 RSR back to Nick Tandy with 35 minutes to go. The Briton, who was the first driver to take up a race for the second time from pole position since the championship was inaugurated in 2014, managed to gradually extend his lead and ultimately bring home the second victory of the season for Porsche. After 122 laps, Jörg Bergmeister (Germany) and Le Mans winner Earl Bamber (New Zealand) crossed the finish line in seventh at the wheel of the sister 911 RSR campaigned by Porsche North America. Wolf Henzler (Germany) and Bryan Sellers (USA), the Watkins Glen winners, had to park their 911 RSR fielded by the Falken Tire customer team with 15 minutes to go due to a faulty transmission – a consequence of becoming caught up an earlier collision. 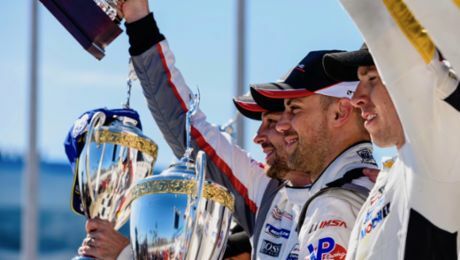 Round 7 of the Tudor United SportsCar Championship will be contested on 9 August on the storied Road America circuit in Elkhart Lake (Wisconsin).